Artwerker-Artwork & Architectural Designs by Robert L. Martin. 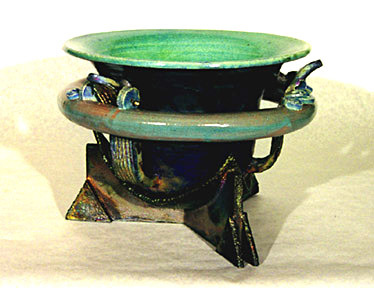 Ceramics,pottery,sculpture,vases. Play Sound: Quote from the movie "Beatle Juice"
"Containment No. 33" ceramic with cerdic stain, glazes, and "silver leaf"
"Vessel No. 17"- Raku with cerdic stains and glaze. "Vessel No. 18"- Raku with cerdic stains, bronze, and glaze. "House of Clay"- Earthenware with cerdic stains, and glaze. © copyright 1995-2004 Artwerker Designs. All Rights Reserved.